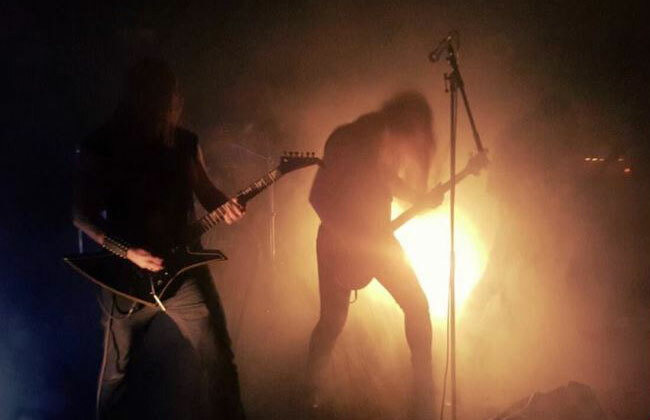 Switzerland’s Deathcult have dealt aplenty with mortal transience, involving members both breathing and not. From lessons learnt in death, we hear why existence should be treasured regardless of karmic or divine judgement. – DEATHCULT exists as a tool for us to follow our devotion to death metal, says guitarist P Nekros, all of us are firmly rooted in the early kind. It’s a big part of our lives, as is music in general, so we’re certainly no ‘fun band’. Initially starting out as the one-man project of founder and drummer M Goathammer in 2010, it was soon apparent that the songs he was writing would require a full line-up. Thus, one was assembled the following year. – We began rehearsing and had soon written a few more songs, says the Goathammer himself. Since everyone had their own bands it took quite a while before we were ready. Our demo was released in November 2012 and we played our first two gigs shortly thereafter. Alas, they had only just managed to gain some momentum when bassist and close friend D Virgin Killer was diagnosed with skin cancer. – Three months later, our brother passed away. This was a personal catastrophe for us. Seeing a close friend wither away and perish in a matter of months, did this in any way alter your perspective on mortality and human purpose? – No, speaking for myself it changed nothing. Death has been a part of our lives ever since we were born and we have to deal with it – and so we did, spending as much of his last time together as we could. I know it gave him some moments where he managed to forget his disease. Even if he is no longer here in person, says Goathammer, his presence will always be felt in the band and he shall never be forgotten. Having a number of gigs booked at the time, they made the best of the situation and brought in O Diaboulus as session bass player. – He soon became a good friend to everyone in the band and we decided to work together – to keep the flame of DEATHKULT burning. – It does sound good, yes – but it also has a link to the style of death metal we play, including the themes and lyrics one can expect from us. How much does metal music really represent death then, I wonder. In this day and age – the most commonly referred to ‘death cult’ is ISIS, a theological assembly unlikely to require any further presentation. How is this death cult different from the concept you espouse? No one wants to comment. Charging boldly into the ensuing silence, I am instead curious if it was darkness or death metal that first came into their life. 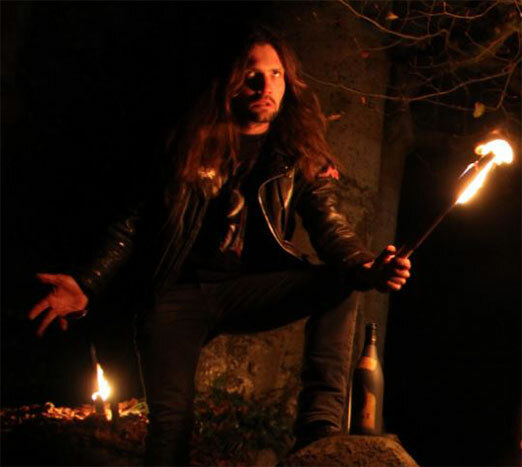 – Definitely death metal for me, says Goathammer, I started to listen to it when I was 13 years old. In fact, the darkness came with black metal one year later. The “Pleading for Death… Choking on Life” EP was recorded in 2013 and released in the beginning of 2014. Forward to summer 2015; DEATHCULT enter the studio to record their debut album, “Beasts of Faith”. – At that point it was decided that Diabolous had to change from bass to his usual instrument, because he’s an amazingly talented guitar player. The album was recorded in the OSA Crypt Studio, a facility built by P Nekros and close confidant Mentor, drummer of BLAKK OLD BLOOD, TEMPLE OV PERVERSION and ANTIVERSUM. – Mentor runs the studio, says Nekros, so he helped us out with the recording. We only used our own equipment, like some great old amps that I have; a Hiwatt DR-103, a destructed Roland JC-200 and others. It’s important for me to record with gear I’m familiar with. Nekros and Goathammer recorded the guitars and drums live while the rest was overdubbed. – The album was built on a core live recording; this is how we’ve always started our studio sessions with DEATHCULT – it’s how we work. Before the album was finished, they mutually agreed to part ways with bassist and vocalist O Ketzer – also known from BÖLZER. – Everything was recorded besides the vocals. S Phoberos was recruited as singer and bassist and went on to do an awesome job on “Beasts of Faith”. It was the first time he recorded an album as a singer but he nailed it in two days – also his lyrics have a unique style and message. Unsurprisingly, the inspiration for these lyrics is ‘death’. – Much of it is a simple expression of our love for old-school death metal, says S Phoberos, and as you know – death has long been part of our journey. I’m a newer part of DEATHCULT, but I’m pretty sure it’s an evolving theme without becoming kitsch or boredom. They also contain an element of his personal history with mortality. – In my past I was often confronted with death and the process of dying, and of course the acceptance of letting your self go. There are still demons haunting me – ones that I struggle with, so the lyrical concept is intensely personal. I’d obviously love to hear more about this, if you’re open for it? – Well, it’s very private and there’s a lot of stuff I just can’t frame in human words but I’ll give it a try. When I was around four years old, I had a visionary lucid dream. He describes finding himself stranded in a desert – completely alone, save for the gentleman decoratively attached to a massive crucifix. – This guy – guess who, was covered in blood and had a very, very scary face. He looked down at me and spoke the words: Don’t be afraid, come with me. While acknowledging that he was dreaming, the young Phoberos still sensed there was something amiss with the messianic invitation. According to his mother, from that night onwards he would often talk in his sleep and even embark on mid-slumber strolls. Worthy of note, he points out, is that his home was not a religious one. – Another time a few years later, I heard the same voice urging me to come with him, and again I declined. When I woke from the dream there was an electricity in the air, something unnameable – I couldn’t hear or see a thing but sensed a dispersible dust in the air. Shortly afterwards, he felt an intense pain start developing in his throat. You have a t-shirt depicting a church about to be horizontally renovated, are you an anti-Christian band? – It’s a famous building here in our hometown Zurich, says Phoberos, the large skeleton represents DEATHCULT. The Great Leveller bears a torch that’s about to be swiftly swept downwards in an architecturally disassembling motion. Reaching the end of its arch – the torch inverted is the symbol of Thanatos, the personification of death in the Greek pantheon. – We are against enslaving religions in general, not just Christianity – they’re all very dangerous and hungry monsters. It is not the religious or Catholic concepts themselves that are dangerous, in fact I think it’s amazing how the spiritual language morphs words into a different meaning. For instance, he says, when a Catholic takes the Eucharist and tastes the flesh and drinks the blood of the Redeemer – at that moment it really is the Wine of Christ and bread of the Last Supper they consume. – It’s the blinded ones doing the really bad things out there, and we are in favour of both freedom of opinion and art. If there are institutions who really represent fear and terror in the words of dusty old papers, then yes – we are an anti-Christian band. And hey, spiritual concepts to and fro… in the end – only death is real. DEATHCULT belong to something known as the C.H.A.O.S. Circle. – There’s not that much to say, says Goathammer, it was founded back in 2011 with the intention to gather, support, and promote each band under the banner of the circle. The C.H.A.O.S. symbol can be found on each or most of the records. Since 2015 they also run a festival called CHAOS Ritval, where they present international underground acts in traditional black, death, heavy, and doom metal. Is it a music-oriented congregation, or is there some ideological aspect to it as well? – Primarily musical, says Goathammer, but this doesn’t mean that any band we are friends with can join. There’s a personal thing behind it, and for example if someone wishes to be part of the circle then each member must give approval. If one disagrees, then it won’t happen. 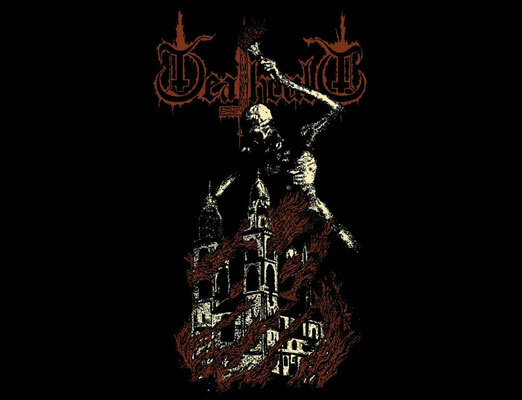 With a conceptual inspiration from death in general, their musical output could certainly be said to gravitate towards the Swedish variety. – True, says Goathammer, but we are also influenced by other countries’ scenes. Mostly by the Scandinavian way of death metal though, in particular its morbid and obscure atmosphere. He says that Sweden has seen a resurgence in genuine and quality death metal in recent years. – Many great bands were founded and released good demos and albums; INVIDIOUS, INVERTED CROSS, GRAVELESS, DEGIAL and the mighty ENSNARED are some of them. All of those are fairly traditional – do you like anything more ‘progressive’, as I believe it’s called. – My way of thinking about and playing death metal is very traditional, but that doesn’t mean that there’s no space for creativity. Bands like MORBUS CHRON or TRIBULATION for example, both of them did a great job with their second albums. The mixing and mastering was done by Olof Wikstrand of Swedish heavy metal band ENFORCER, who has also recorded TRIBULATION among others. – Olof and I spoke at length before we decided that he should mix the album, I was familiar with his previous work and know what drives him; he’s dedicated to the old way of death metal. It was natural to ask him, he has a great ear for music and we are very happy with his work. Goathammer is not among those who believe the death metal underground is in any form of decline. – If we talk about so-called old-school death metal – which for me means the real thing, it is more extreme than in the past. I see people taking it more seriously than back in the 90s, bringing it to an entirely new level. He points out that this is, ironically, partly thanks to the normalisation of death metal. While merely playing fast or having gore-ridden lyrics and artwork was enough to be deemed ‘extreme’ in the past, today it requires genuine dedication to be taken seriously. Is it a requisite that a death metal band actually mean what they sing about? – I’m not sure about that, says Phoberos. There are plenty of so-called real satanic or occult bands who deal with that image, and maybe they believe in what they saying. But if this really stands for quality, hmm. It’s the will to power that counts, he says, a band must have raw energy – the urge to kill, if need be. – Satanistic stuff, Lovecraftian themes and so on… I think that’s more about creating a feeling, an overall picture. And if they use harsh lyrics, heavy riffs and a strong visual message – they are able to create even more extreme and unique music. Phoberos adds that he finds it somewhat ridiculous with secular westerners dressing up in ceremonial attire of foreign cultures they know little about. – I also don’t like the simplicity most pseudo-satanic or quasi-occult metal bands show in artworks and lyrics. They mostly sound boring and stupid, and often narrowminded. Gods and religions, he proclaims, are nothing more than means to enslave the living. – To give the feeble hope, mostly through divine intimidation. Some of these institutions may have been founded with good intentions but in the end, they became an instrument of might. And might is always built upon fear and terror. Much has been said about earthly expiration, but not much about what happens next – if anything? – Beside the possibility of an afterlife, which for sure does not mean an old man sitting on his throne passing judgement – I think you should enjoy your lifetime. Do good things, or at least don’t be a fool. Not for what comes after – your life is happening right now and you must deal with all its consequences. Phoberos suggests that one should strive to be a decent person, regardless if it’s under threat of eternal damnation or not. – There is no space in the heart for hurting others or doing bad things to weaker ones. And what if you are wrong and after you die, there is something entirely different from what you expected? Well, even if there’s just the great nothingness, you didn’t lose anything – right? The beyond is not something that fits the framework of human religious doctrine, he says, it’s something intangible that resembles the process of the caterpillar becoming a butterfly. – Your soul reaches another sphere and becomes an entity of pure energy. Maybe there’s a kind of twilight zone, but that’s all personal. I see death as the pupal stage for both the living and the dying. One will grow and break out of it – the other takes a step behind the curtain.